This declaration is partly inspired by the Tokyo Appeal issued by the First Thematic World Social Forum for a Nuclear-Free World held in Tokyo and Fukushima in March 2016. To endorse the declaration send name, location, and e-mail address to <ccnr@web.ca>. Nous la signons. «Echo-Echanges ONG France-Japon» est le nom de notre association qui a été une des locomotives pour réaliser le premier Forum Social Thématique à Tokyo [en mars 2016] et j’ai été un des facilitateurs. Kolin Kobayashi, Paris. To avoid the final apocalyptic scene of lovers clutching one another in a nuclear meltdown (in the fine 2013 French film ‘Grand Central’), I like many others before and still more after me, firmly endorse the Montreal Declaration to End the Nuclear Fission Age (World Social Forum, 2016) -- including Arms, Wars and financially- profit- or strategically-driven politicized waste management, rather than one of collective responsibility and non-profit nature. Raymond Stone Iwaasa, Kaienkéhè:ka, Québec. Afin d’éviter I’ultime scène apocalyptique du bon film français ‘Grand Central’ (2013) ou les amants s’embrassent en pleine fonte d’un réacteur, moi, Raymond Stone Iwaasa, j’appuye, tout comme plusieurs ont fait avant, et encore plus feront après moi, ‘La Declaration de Montréal’ issue du Forum Social Mondial (2016) -- incitant globalement la fin de l’âge de fission nucléaire et tout armement, guerre ainsi que des spéculations ou manigances financières ou politiques liées aux déchets plutôt que leur gestion collective responsable et non lucrative. Raymond Stone Iwaasa, Kaienkéhè:ka, Québec. I, Ronald (Ron) Campbell Craven born in Toronto Ontario Canada and presently living in Osoyoos British Columbia Canada hereby endorse the Montreal Declaration for a Nuclear Fission Free World. I do so, not for my benefit � as I expect to be long deceased before this can be achieved � but for the benefit of the human race which is certain to destroy itself if this declaration cannot be achieved before enough nuclear tragedies occur to make the effects overwhelming to life on this wonderful planet which God had prepared for our enjoyment. All life on this planet is a blessing and should be protected from the greed and hunger for power that induces powerful people to risk everything God has given us so generously. It is the primary requirement of every person on the planet to dedicate his/her energy directly or indirectly to this goal and I urge everyone who becomes aware of this Declaration to set aside as much as possible all other endeavors and dedicate their undivided attention to this purpose for it is the one endeavor that can prevent extinction of the human race along with all other higher forms of life on Planet Earth. Please keep me informed of any activities that are planned to bring this objective to fruition. Ron Craven, Osoyoos BC. We on the National Middle East Committee know that our president has endorsed the declaration for all of WILPF [Women’s International League for Peace and Freedom]. But we like the declaration so much that we want to endorse it also. It expands our Weapons-of-Mass-Destruction-Free-Zone in the Middle East to all of the world. Wonderful! God bless you for what you are doing. Ellen Rosser. I strongly support the Declaration for a Nuclear Fission-free World. I also oppose the Government’s position on cluster bombs. Eleanor Roosevelt was right back in 1964 when she said all nuclear internationally should be under control of United Nations. At least, that is how I feel. I think she was light years ahead of her time and her book Tomorrow is Now, written then, is one that I would not part with for anything. Shirley Bush, Toronto. I shall try to limit my response in words, but I must express the joy of reading of a movement that promises to focus energies on human potential for peace-making. Since the late ’40’s when I attended meetings with atomic physicists in Chicago who were pleading for control of this deadly weaponry, I do what I can with my limited facilities. I now live in rural Michigan as simply as possible, learning and supporting co-operative endeavors. I cannot donate or travel very far for gatherings, but I can write letters to editors and some attention-getting poems, but, at 88 years, most of my unfinished projects may remain unfinished, however I am gaining more courage to speak out and Wild Democracy has the language I wish to learn to explain to anyone with a listening ear the laborious path to a peaceful planet. Thank you all for the spiritual “high”. Bless you, Ruth B. Dimmitt, Michigan. L’application actuelle du nucléaire est une erreur magistrale de notre part. Il ne devrait y avoir ni honte et ni regrets à l’arrêt complet du cycle nucléaire tel qu’on le connaît. Mieux vaut faire demi-tour que de s’effondrer dans un précipice. Quand verrons-nous ce danger immédiat? Votre ami Pierre Bouchard, Ontario. Hi, Please include CCNS [Concerned Citizens for Nuclear Safety] as a sign-on to the Montreal Declaration. The declaration contains powerful intent and wonderful language to bring people together for a nuclear-fission-free world. Best, Joni Arends, Santa Fe, NM, downwind and downstream of Los Alamos National Laboratory - the birthplace of the atomic bomb. Mes félicitations pour ton texte tout à fait génial! Je i’endosse avec enthousiasme et avec fierté! Das ist eine Sternstunde der Menchheit! Avec mes salutations, Michel Duguay, Québec QC. Dear Friends, I just read the Montreal Declaration and I am profoundly moved with gratitude for this comprehensively written piece which is probably the single most important goal we could have (and Global Warming). I would like to be a signer to this Declaration. As an individual. I will share it with some others and ask them to consider signing either as an individual or as part of a group to which they may belong! I love the Message of the Montreal Declaration and I would love to sign it as an individual, but I no longer have the stamina to do anything significant of the things listed. I am now 91 years old and simply do not have the energy that some my age still seem to possess. But I am grateful for what I have and I appreciate more than I can express the work you are doing to eliminate nuclear weapons and nuclear power and all the terrible problems associated with them and their manufacture, storage, disposal(? ), etc. Many blessings, Sister Gladys Schmitz, Minnesota. REPLY: Thank you Sister Gladys for this heart-warming message of support. I am sure that your spiritual energy is at least as valuable if not more valuable than the physical and mental energy of us “youngsters” (I myself am 76 - a spring chicken!). I am glad to know that you are from Minnesota, you are the first from that state to endorse the declaration. Peace, Gordon Edwards. P.S. About 1950 I attended a large science exposition at the new Rochester civic auditorium. Down one of the adjoining halls various films were running. One 16 mm set-up was showing one of a set of 3 films done by the Military (maybe the war dept?) for the doctors in the military. Film one showed the physics of the bomb, and the results of its use in the experiments in the NV desert. (or wherever) Film 2 showed the devastation in Hiroshima and Nagasaki – the leveling of the city, the burned people etc. Just TERRIBLE! Film 3 showed the effects of radiation sickness on victims, the burns up close, many slides of tissue, etc. Each was about an hour long. It could be ordered free from a catalog and I did that for a couple years. Suddenly in 1954 it was no longer available. I have always been sorry that I did not keep the catalog. In the 70s and 80s I tried to see if I could track it down, but I was unsuccessful and have never heard of any others who had seen the films. Have you ever heard of them? Je suis entièrement d’accord pour un monde sans fission nucléaire, je vous envoies mon soutien pour le devenir de notre planète, et I’avenir de I’homme pour les années qui viennent. Merci à vous d’être là pour réaliser un monde meilleur. Marie-Annick. The thinking behind and wording of the Montreal Declaration are sensitive and elegant. I’m glad to have had the opportunity to help bring it out into the world. Looking forward to future collaborations. Joseph Gerson. J’habite un petit village dans la montagne appelé Saint Jean de Vaulx, à 30 km de Grenoble, région Rhône-Alpes. Je soutiens cet appel de Montréal et je vais le diffuser le plus largement possible. Amicalement, Marc Ollivier. Yeh for all of us! A wonderful declaration, a superb piece of work. Lee McKenna. Oui! l’Association de Protection de L’Environnement des Hautes-Laurentides (APEHL) endosse la déclaration de Montréal puisqu’elle demande la fin de l’exploration et un moratoire permanent sur l’exploitation de l’uranium au Québec. Merci pour cette belle initiative devenue action collective mondiale par la reprise du flambeau des collègues militants anti-nucléaires brésiliens, Salutations amicales, François Lapierre. Hello, I’m Tony Langbehn, Convenor of Maryland United for Peace and Justice. We have endorsed the declaration and are committed to the effort. Thank you! Thanks so much for your work on this crucial issue. It is an especially important matter for folks who reside in Saskatchewan to become involved in, since so much of the world’s uranium comes from mines in Saskatchewan. Florence. I want to endorse this proposal and thank those who worked diligently to make it possible. Kimon Kotos. As a member of the human race, I endorse the Montreal Declaration. Regards, Judith Taylor. 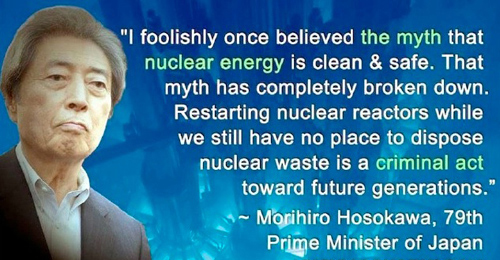 I wonder if a nuclear-free world is possible. Not likely in my lifetime – I’m 86. Shirley Grant. Okay, include me. 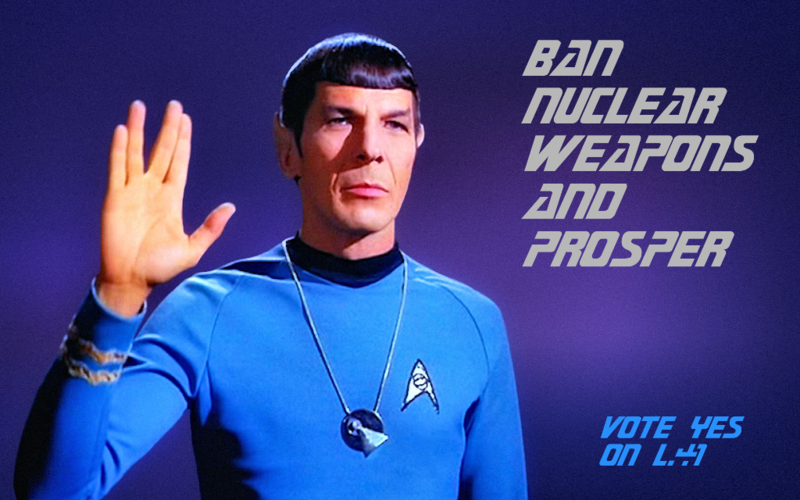 I must say it’s the first time I had heard it proposed to eliminate even all research reactors. But I guess it makes sense, considering the potential for misuse. Cheers. Chandler Davis. I endorse the Montreal Declaration for a Nuclear-Fission-Free World. Thanks for being a much needed leader on this issue! Michel Goudreau, Gaspésie. Super! Le Mouvement contre le crime atomique (MCCA) a deja signé! J’enverai le “link” en Francais aux autres. Amitiés, Peter Van der Does. On behalf of AWAKENING/art & culture, our 501 (C)3 organization – dedicated to artistry, heritage, imagination and the public interest – and the annual convener of Abolition 2020- Hiroshima / Nagasaki Commemoration in Orlando, Florida, I, Nelson Betancourt, enthusiastically endorse the Montreal Declaration for a nuclear-fission-free world. On a personal level, I am involved in this work because my father died of delayed radiation after working in the atomic test site in Amchitka, Alaska. Sincerely, Nelson Betancourt. Thank you for all your work. This is the most important initiative in both the climate change and peace movements. I hope it quickly will be signed on to around the world, and soon by us in the U.S. I will do my best to spread the word not only among the Friends but in all my other contacts. Barbara Kuesell, New York Quaker. The declaration makes the crucially important point that any playing around with nuclear materials is too dangerous to risk. This “action” should be left to the interior of our friend, the sun. “He” knows how to handle it! I gladly endorse the declaration. Gregory Laxer, Vietnam War Resister. It is with great appreciation that I am writing to endorse the declaration made at the World Special Forum in Montreal, earlier in August of this year. Thanks for all you’re doing, Jerry. The Montreal Declaration is a timely, important call to mobilize our collective energies in the hope and certainty that public will is the force that can stop the disastrous addiction to nuclear threat and power before it is is too late. The future of civilization depends on elimination of nuclear weapons, and, given the inextricable link between nuclear weapons and nuclear power, both must go. An instrument that promotes awareness, understanding, and action is a great gift to our world. Phyllis Creighton. Je suis membre d’un reseau créé à cette même fin par un collectif de Japonais résidant en France : Yosomononet, et me sens directement concernée (comme devrait l’être toute personne doté d’un peu de lucidité) par les suites de la catastrophe de Fukushima Dai-ichi en mars 2011, et plus globalement par la menace monstrueuse que représente pour la planète l’arsenal de toutes les bombes nucleates déjà prêtes à devenir opérationnelles. Je vous remercie donc de bien vouloir continuer à me transmettre l’état d’avancement de votre démarche par courrier électronique indiquée ci-dessus. Dominique Palmé. I also would like to endorse the Montreal declaration. Thank you ever so much for organizing this great declaration. Kimiko Hinenoya (Japan). J’appuie sans réserve la Déclaration de Montréal pour un monde libéré de la fission nucléaire. Bravo pour cette initivative. Au plaisir, Guylaine Maroist. Quite an impressively -- written statement! Keith Gunter. God bless you for your great work! Peace and blessings, Ellen Rosser, Ph.D. I wish to endorse this vitally important, eminently sensible declaration. Lucy Lee Grimes Evans. Conscient de la dangerosité du nucléaire militaire et du nucléaire civil, je suis favorable au désarmement nucléaire sur toute la planète et au développement des énergies renouvelables pour abandonner définitivement l’énergie nucléaire. J’approuve totalement les orientations de la Déclaration de Montréal pour un monde libéré de la fission nucléaire. Thierry Plouzennec. Federation of Rainbow Warriors, Margao, Goa, India would like to be a signatory to the subject declaration. We are strengthening local communities through information and organization to be self-reliant and self-governing units, in order to conserve and protect our land, water and environment for future generations. We are strongly for a nuclear free world and support all resistances to existing and proposed nuclear installations. Thanking you, Rony Dias. THANK YOU for this gorgeous truth telling statement. Sheila Parks Ed.D. Great work you are doing. We [Pilgrim Coalition] are busy shutting down Pilgrim Nuclear Power Plant in Plymouth, MA. Wondering why you focused on nuclear fission. I would think that in the end fusion will be just as dangerous. Just a way to siphon funding from real renewables like wind and solar. Paula Sharaga. REPLY: There are 3 types of nuclear energy: fission, fusion and radioactivity. (1) Existing and projected nuclear weapons and nuclear reactors all use nuclear fission. Fission technologies all depend on uranium and a uranium derivative, plutonium. This makes it conceivable to maintain a ban on fission technology by preventing access to uranium and plutonium. (2) Viable nuclear fusion reactors do not exist. Thermonuclear weapons (“H Bombs”) use nuclear fusion, but they cannot function without fission to ignite the fusion reaction. So nuclear fusion, in itself, is not a present danger. Fusion is also a lot harder to prevent because the raw material is hydrogen, which is everywhere. (3) Radioactivity (“gamma ray” energy and “alpha and beta” particles emitted by unstable atoms) is used in scientific research, in medical practice, and in several industrial applications. There are dozens of naturally occurring radioactive elements, as well as a large number of artificially-created isotopes. The production and use of these isotopes does not require nuclear fission. So large numbers of scientists can easily endorse the call to eliminate nuclear fission technology without compunction. (4) If we wish to get rid of those aspects of nuclear energy that constitute a real threat to human survival, without alienating hordes of “otherwise sympathetic” people in science, medicine and industry, this can be done by eliminating only nuclear fission technologies. Other uses of nuclear energy pose separate challenges that can be addressed separately. Gordon Edwards. The resolution was adopted by a large majority, with 113 UN member states voting in favour, 35 voting against and 13 abstaining. with excerpts from Carla Stea’s coverage of UN Resolution A/C.1/71/L.41, calling for a legally binding instrument to prohibit nuclear weapons, leading towards their total elimination. 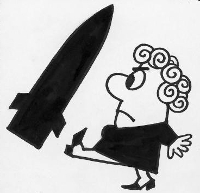 Here is an example of a message sent by John Hallam of Australia to his fellow Australians, urging them to put pressure on the Australian Government not to oppose the UN General Assembly resolution L41—calling for negotiations to begin next year (2017) for a legally binding treaty prohibiting the possession of nuclear weapons. That resolution will be voted on within the next several days. This is a response to Australian Government indicating it will vote NO. See International Campaign to Abolish Nuclear Weapons 18/10/16 Action Alert: Australia must vote yes to a ban! Professor Gordon Edwards (Hampstead, Quebec) head of the Canadian Coalition For Nuclear Responsibility (CCNR) one of the key speakers at this nuclear forum, (which consisted of 12 workshops. the most numerous of the hundreds of other themed subjects at the recent World Social Forum) opined that we have left the nuclear age and are now in the nuclear waste age. a reference of sources pertaining to this vital project of eliminating all nuclear weapons, ceasing generation of any further high-level (and low-level) nuclear wastes by phasing out all nuclear power plants, and halting all uranium mining globally for the sake of the future of All Life on Earth.